Global Body Fat Measurement Market is expected to grow at a CAGR of 9% to reach US$ 1,023.5 million in 2024. The growth rate is coupled with a rising incidence of metabolic disorders and obesity throughout the globe. Unnatural lifestyles such as sedentary routine and excessive fast food consumption are the primary reasons for overweight and obesity. Various instruments are used for measuring the body fat. Muscle to fat ratio analyzers is one of them. These are used for precise assessment of muscle versus body fat. These instruments also analyze health risks associated with high fat in the body. Further, these devices help in evaluating the effectiveness of nutritional intake and exercises done by an individual. Other factors including rising advancements in the BIA devices, expansion process of major players in the international market and rising consciousness regarding increased body weight are also expected to drive the Global Body Fat Measurement Market. According to the World Health Organization (WHO), in 2016, more than 1.9 billion adults across the globe were considered overweight. Of those, over 650 million individuals were suffering from obesity. This trend is more prevalent in developed countries such as U.S., Canada, and U.K. Thus, it is expected to drive the body fat measurement market through the forecast period. In 2017, North America held the highest Global Body Fat Measurement Market share. The market is driven by rising obese population in the U.S. According to CDC report, more than third of the population is obese in the U.S. Further, rising awareness regarding life-threatening conditions associated with obesity such as stroke, diabetes, and heart diseases is also expected to drive the market in North American region. In addition, the presence of a wide target population, increasing awareness regarding fitness and health, and technologically advanced healthcare infrastructure are likely to contribute to the growth of the market in North America. Asia-Pacific is expected to have a higher growth rate in the forecast period. The growth rate is coupled with increasing demand for body fitness in the countries such as Japan and China. Moreover, the presence of a large number of BIA device manufacturers in the region also expected to drive the market through 2024. 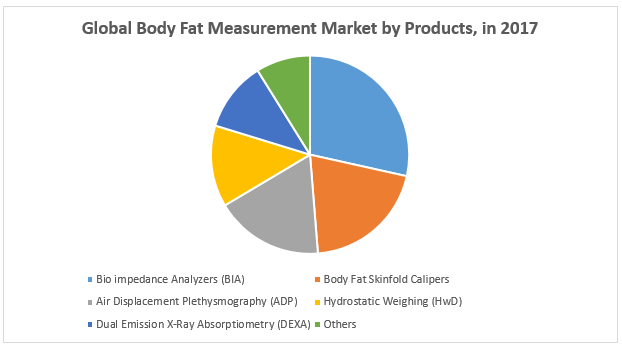 Bio impedance Analysers (BIA) segment held the highest Global Body Fat Measurement Market share in 2017. The market is primarily driven by continual technical improvements in these devices to address the growing needs of individuals. These devices provide increased accuracy and efficient combination with hydrostatic weighing and callipers and thus, drive the Global Body Fat Measurement Market through the forecast period. What information is covered in the report? 6.4.11. Jawon Medical Co. Ltd.
6.4.22. Devicor Medical Products, Inc. Global Breast Imaging Market: Global Industry Analysis and Forecast (2018-2026) –By Technologies, and Region. Global Blood Group Typing Market – Industry Analysis and Forecast (2018-2026) –By Product, Technique, Test Type, End User, and Region. Global Teeth Whitening Product Market – Industry Analysis and Forecast (2018-2026) – by Product, Type, Application and Region.